I love it when they’re as nice in person as you hoped. Yay, Marcus! 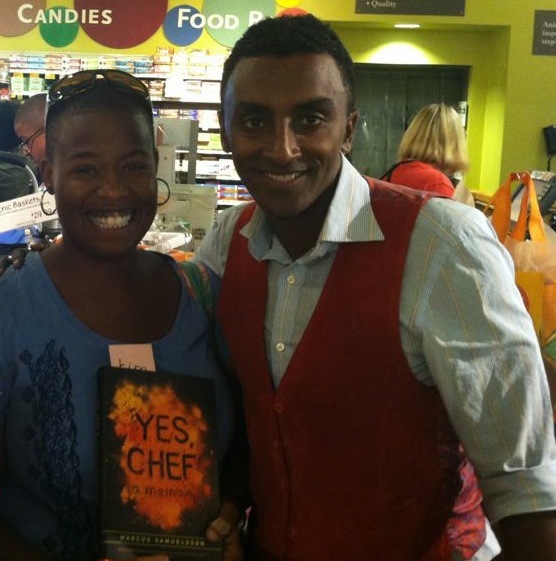 I prefer a porous classroom: one that, when, say a famous celebrity chef comes to town, you can decide to read an excerpt from Yes, Chef and go meet Marcus Samuelsson at a Whole Foods that’s only a short walk away. That was class today. Through some nice asking, following up on a contact from a conference, and some planning, students were able to spend a few moments taking pictures, getting slips of paper signed and asking Marcus questions about his life and career. He was quite pleasant: posed for pictures, talked about Ethiopia to kids of Ethiopian descent, told them he was more nervous talking to THEM than when he was on Top Chef: Masters. The kids conducted themselves professionally, as expected: they were giggly, attentive, a bit awestruck. We thought he was going to do a cooking demo, but it was entirely a meet and greet: signing books, shaking hands, taking pictures. I had hoped he’d read a bit from his book, but I think that’s the difference when readings are done in supermarkets and not bookstores: you’re there to meet the person, not necessarily to get the entire ambiance of intimacy that I so love about book signings. Still, though, it meant something to the kids. To the Whole Foods clientele, though? Different story. I don’t think they knew quite what to do with a large crowd of Black and Brown adolescents. Usually, I’d wager, many of them are trying to avoid them. I am looking forward to being able to have the run of the city again, in that respect: to peruse the newspapers and map out readings, signings, art gallery openings, exhibitions…to expose students to all the city has to offer. All OUR city has to offer. To be Black and Brown in public spaces, and to confirm to those who don’t know, while reaffirming to the students, that learning happens all around us, and it’s ours if we merely walk outside. I think I thought I knew what rigor meant when I taught exclusively in urban schools. It meant holding kids to high expectations, of writing a lot, of reading a lot, of showing kids how to mine the text, to analyze, to synthesize. Then, I went to the suburbs and I realized how much I didn’t know. My writing instruction, which was strong, got stronger because I am now much clearer about what is required to help kids become powerful writers. I’ve always believed that to become a good writer, you have to write. But, only this week, while teaching in my summer program, did I understand the difference between what the city does and what the suburbs do, and the difference is, conceivably, why urban kids are perpetually behind. I asked one of my sophomores how many papers she writes in a year. She goes to an exam school in the city: highly competitive, motivated, does her work, all of that. She told me five, usually following after reading a whole-class text. In the ‘burbs, kids are required to write four papers PER TERM. Add that up and you get a total of 16 papers per year. That’s 11 more papers than kids in the city write–and let’s be clear, this is one of the exam schools, so no telling what kids are writing at schools that are non-exam. That’s the problem right there. If kids aren’t writing enough, then they’re not improving, not revising…and they’re always behind. You become a better writer through practice. Not rocket science to know that if you don’t get enough practice, you’re not going to become proficient. Sure, there are all kinds of distinctions between city and suburbs, but facts are facts, I’d argue. There is a disparity in what we are asking kids to write. I like data. I like knowing what I’m up against. Over the next school year, we’re going to be writing like our lives depend on it. They actually DO depend on it.